Creating a home with a contemporary style is a popular design trend, but, not as easy to accomplish as it first seems. This is because “contemporary” is defined as “occurring in the present”. As you plan on designing a home that fits this style, you’ll find that what’s “hot” right now, is constantly evolving. A contemporary home takes the best elements from a variety of design styles and brings them together cohesively. 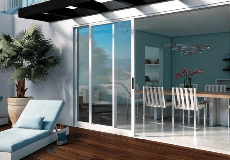 Milgard has provided windows and patio doors for a variety of remodeling and new construction home projects. We’ve pulled together some of our favorites to provide you with a “Best Of” collection of contemporary homes we hope will inspire you. This home embraced the contemporary style by sticking to neutral colors throughout the space. The decoration is minimal, eclectic and feels very fresh. Contemporary homes are filled with light, specifically focused on natural daylight sources. This home used windows in repetition and added a large Moving Glass Wall that provided lighting and an open concept floorplan for indoor outdoor living. The mahogany wood from the original home helped provided design inspiration to the architect. Playing on the homes strong horizontal lines, he achieved something “contemporary and unexpected”. We’d love to know which project was your favorite and how you incorporate contemporary elements into your home design. Leave your comments below.